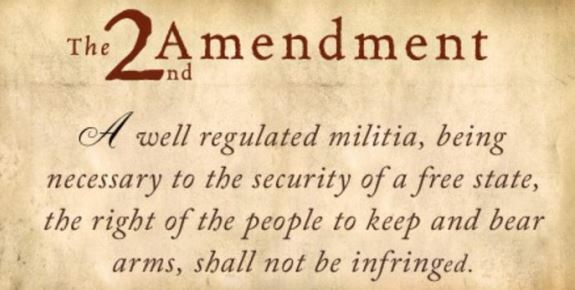 Ever since the U.S. Supreme Court’s opinions in Heller and McDonald, many of the most liberal lower federal courts have flaunted the clear language of the Constitution and been making up their own rules when it comes to the Second Amendment. Last week’s outrageous opinion by the full U.S. Court of Appeals for the Fourth Circuit in Kolbe v. Hogan is but the latest example of this. In that case, nine of out fourteen judges ruled that AR-15 style rifles, America’s most popular types of rifles, that were banned in the state of Maryland, have no Second Amendment protection. You can listen to the oral arguments through this link. The Court called the banned firearms – which include AR-15s and most magazine-fed semi-automatic rifles – “exceptionally lethal weapons of war.” It compared them to the M16, which the court claimed made them categorically unprotected by the U.S. Supreme Court’s decision in Heller. The Court called the difference between a machine gun and a semi-automatic “slight,” despite the substantial differences in function and form, so much so that the federal law regulates each in highly dissimilar ways. And in doing so, the judges joining the majority opinion actually said that they do not consider themselves bound by the Supreme Court’s majority decision in Heller (to say nothing of their sworn oath to uphold the Constitution). As our friends at the NRA-ILA observed, Heller concerned the most demonstrably lethal and crime-associated of all firearms: the handgun. Handguns are implicated in more deaths, and more firearm-related crimes, than all other types of firearms combined … by a very large margin. This was extensively briefed for the Supreme Court during the Heller proceedings, and no one contested that argument. In the post-Heller era, the same could be said of the detachable magazine-fed semi-automatic rifles of the type banned in Maryland. They’re not just popular guns, they’re the most popular types of rifles on the market today. And the fact that many, many millions reside in the hands of Americans, with such a miniscule percentage used in violent crime, show that they are overwhelmingly kept and used for lawful purposes. Of course, virtually every author of every gun control law that has ever been passed or proposed has claimed the measure is a matter of life and death. Never mind that few can show any actual evidence their proposed restrictions will save lives. And even if they could, Heller could not be clearer that this claim does not end the matter when it comes to banning the sorts of arms commonly kept by law-abiding citizens for lawful purposes. The majority very specifically rejected Breyer’s attempts to use inapt analogies and “interest-balancing” to preserve D.C.’s handgun ban. Inapt analogies and interest-balancing, however, are exactly the techniques employed by the Kolbe majority. They counterfactually try to analogize AR-15s to M16s and other “weapons of war,” and then they insist such firearms can be subject to a ban because they’re dangerous. It’s likely that any ban of any type of firearm – and under any circumstances – would survive this shallow and self-serving rationale. One of the most interesting briefs filed was an Amicus Curiae filed by Pink Pistols, the Congress of Racial Equality, and Women Against Gun Control. The brief challenged Maryland firearms ban, and the arguments of those who defend it, arguing that the Maryland law depended far too much on the appearance of certain semi-automatic rifles that are demonized as “assault weapons”—a category that does not actually exist in firearms taxonomy. The “military-style” aesthetics that so preoccupy the ban’s defenders are both misleading and irrelevant, and may constitute the ultimate triumph of form over substance argued the brief. But with the Second Amendment, as with so many things in both law and life, it is substance, not style, that matters. Indeed, even if it were appropriate to classify the firearms outlawed by the FSA according to their style rather than their function and use, said classification would nonetheless define—and outlaw—“an entire class of ‘arms’ that is overwhelmingly chosen by American society for that lawful purpose [of self-defense].” And that, as the Court made clear in Heller, is what the Second Amendment will not countenance. Pink Pistols, the Congress of Racial Equality, and Women Against Gun Control argued that their members are particularly sensitive to this issue because their membership consists of political minorities who have historically been denied equal enjoyment of the liberties enshrined in the Bill of Rights. Their argument that once the courts permit political majorities to chip away at one enumerated right (such as the right to bear arms), all such rights are at risk, especially for those whom society and the law have sidelined for so long was particularly compelling when one looks at the historical basis for gun control in the discriminatory laws of the post-Civil War South. It’s bad enough that the Fourth Circuit considers the choices actually made by law-abiding people irrelevant when it comes to the Second Amendment, contrary to the clear admonition of Heller. Yet the court’s reasoning is worse than that. It challenges the very notion of freedom itself and the ability of a free people to govern themselves and make their own choices from available alternatives. It puts the people who vote and pay taxes and follow the law below the government that is supposed to serve them and below the criminals who will use every available means to prey upon them. It empowers the courts to decide, on a case-by-case basis, what firearms are “safe” enough for a free people to be trusted to own. This is another example of arrogant federal judges appropriating to themselves the right to abrogate the clear language of the Constitution. Such anti-constitutional actions, and the underlying arrogance that drive it, are exactly the kind of behavior the Founders had in mind when they drafted the impeachment process in the Constitution and said federal judges had lifetime appointments subject to good behavior.